To prepare the Roadmap for the execution of MoU’s with Ching Mai University & Maejo University, Thailand, AUS general body meeting was held on August 14, 2017. An elaborate plan was discussed to device a full length implementation programme in the presence of Hon. DCM Dr. Chowna Mein, Chairman Dr. A.L. Agarwal, MLA Chow Zingnu Namchoom, DC Sh. R.K. Sharma along with the University authorities & officials of Lord Mahabodhi College. Begining of “Swachhata Pakhwara” (Sep 01 to Sep 15) in the University campus under the Pradhanmantri Clean India Mission. Team AUS & Students took pledge to clean the campus & various places in the Namsai district to bring awareness of cleaniness in our lives & surroundings . Flag Hosting & Independence day celebration at AUS by Chairman Dr. A.L. Agarwal in the presence of , VC Prof. V.K. Kawatra, Prof. R.N. Deka, Prof. O.P. Sharma, Prof. Dambarudhar Nath, Prof. Setuma Rawal, Prof. Ven. Bhikshu Panyasara, Major Geeta Goswami, Mr. Susanta Ghosh, Faculty, staff & students. On the Birth Anniversary of Former President of India Dr. Sarvepalli Radhakrishnan, AUS wishes a very Happy Teacher’s Day to the entire Teaching fraternity of the Nation. Celebration of World Tourism Day at AUS Knowledge City, Namsai in the August presence of Hon. MoS- Home Sh. Kiren Rijiju, Hon. C.M. Sh. Pema Khandu, Hon. D.C.M. Dr. Chowna Mein along with Hon. Ministers, Parliamentary Seceratries, & MLA’s of Arunachal Pradesh. Hon. Chief Minister inaugrated the newly made Laboratory Building of AUS & Hon. MoS – Home Sh. Kiren Rijiju laid the foundation stone upcoming Residential Building at AUS. Run for Unity: On the eve of Rashtriya Ekta Diwas & Sardar Vallabh Bhai Patel Birth anniversary, The 186 Battalion of Central Reserve Police Force (CRPF), Jaipur Namsai has organised a Half Namsai Marathon which begin from the Knowledge City Campus. The CRPF personnel, University officials & students, District Administration participated in the event with full enthusiasm. AUS – Department of Buddhist Studies led by Ven. Prof. Bhikshu Pannyasara organised a special meditation camp in campus today. The Special invitee group from Thailand led by the divine Buddhist Monks Ven. Dhammadipo, Ven. Saddhadipo & their team taught a large number of studens, faculty & locals about the role of meditation in life. You are cordially invited to attend the 2nd Convocation Ceremony scheduled on Jan 31, 2018 at Knowledge City, Namsai. Plantation of Trees in the campus on the 6th Anniversary of AUS by the Faculty members. World Environment Day Celebrated with full enthusiasm by the faculty. A seminar followed by Tree plantation activity done during the day. A Teacher’s purpose is not to create students in his own image,But to develop students who can create their own image! Happy Teachers Day! Dear AUSRisers, The Freshers Party 2018 is scheduled on 05/09/18 from 3 PM onwards, Kindly ensure your presence, enjoy breathtaking performances & welcome newcomers. 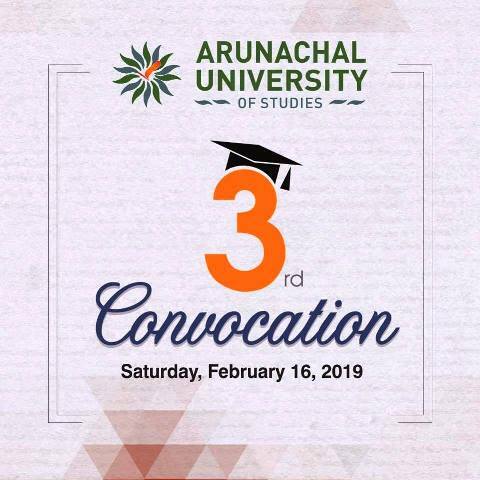 All the faculty members and students are hereby informed that the University is organizing its 3rd Convocation ceremony on February 16 (Saturday), 2019 from 9.30 AM onwards. The existing University alumni who wish to participate in Convocation for the award of Degree/Diploma/Charter Certificates are directed to submit their Application forms as per the instructions given on the overleaf of the form on or before January 22, 2019.